"The greatest football manager that'll ever live in my time is Sir Alex Ferguson, and he was hated by every football fan outside Manchester United. But he was ultimately universally respected, because of his success." Peterborough United boss Steve Evans does not compare himself to the Premier League legend, though there are similarities in how the two Scots have been viewed as pantomime villains by neutrals. Whether it is touchline antics or comments designed to get a reaction - both have played to the crowd at times - there is no doubt the pair have enjoyed considerable managerial success, albeit at very different levels. Here Evans speaks to BBC Sport about his reputation in the game, penchant for promotions and Posh's near-perfect start to the season after a summer of immense change. The first month of every season sees managers up and down the country talk about the time it will take for their summer signings to 'gel'. But unbeaten Peterborough have blown that excuse out of the water - having signed 18 new players and lost more than 20, they recorded the club's best ever start to a campaign to earn Evans the League One manager of the month award for August. "When I visited the board in America to set the strategy for the new season, our chairman listened patiently to what I had to say - I was fortunate the chairman agreed it was time for a rewrite," Evans told BBC Sport. "Every one of those players that joined us was on a paper note from me when I went to visit the board in May. Not 15 of them, every one of them." The wholesale changes at the ABAX Stadium came after Posh missed out on the play-offs for the fourth season running in 2017-18. 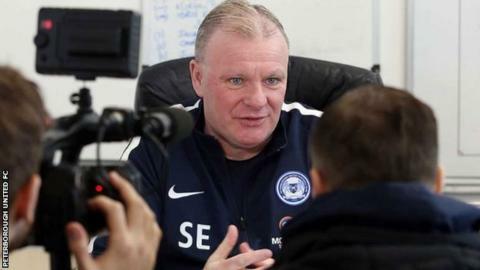 Evans left Mansfield, where he signed 15 players last summer, to replace Grant McCann in February but could not lift the club into the top six. "We failed in the end under me," he said. "We'd have failed under Grant and even Jose [Mourinho] would've failed because there was a weakness in the group - certainly defensively. "But I think by and large - the jury's still out on one or two of them - we've now delivered a squad that's very healthy, competitive and talented." Only this week Evans, 55, was fined after being sent off for misconduct during his side's draw with Doncaster. He is regularly the subject of less-than-complimentary chants from opposition supporters - but is he bothered about what people think of him? "Everyone's got feelings, so of course you care," Evans said. "But I've had fans around the country write to me saying they would love their club to have a manager with the same passion." 'Passion' is a word Evans uses several times. He says Liverpool manager Jurgen Klopp's passion is celebrated in the media, while his is seen as being "a bit naughty". But the former Leeds, Rotherham, Crawley and Boston boss thinks he knows one reason why he might not be liked by the masses. "People don't like someone that wins promotions. Neil Warnock is the only one that's on top of me," said Evans, who has been promoted six times as a manager to Warnock's eight. All the talk has been about the new faces at Peterborough - which include Scotland striker Jason Cummings and ex-Newcastle and Wigan forward Ivan Toney - but centre-back Ryan Tafazolli is one of only two players at the club last season to be a regular in the side this term. Surely he, at least, felt settled going into pre-season? "It was like coming back and signing for a new club, but it's been brilliant," said Tafazolli, alluding to the turnover of team-mates. And what of Evans, who some football fans appear to love to hate? "Word gets around in football, but I was at Mansfield before I came here, and the gaffer was at Mansfield," he said. "The gaffer sets really high standards for us and doesn't want anyone to fall below them - he'll definitely dig you out if you do, but I think that's brilliant. "He's obviously very passionate, so I'm sure many teams that we play against would love him to be their manager." Those who follow the Football League will be familiar with Evans, as well as Peterborough chairman Darragh MacAnthony and director of football Barry Fry. All have reputations as no-nonsense operators, so do things get heated between the trio? "There's been debates, but there's one boss at the end of the day - one leader, one king," Evans said. "The king of the castle at Peterborough United is Darragh MacAnthony." Despite the kind words for MacAnthony, Evans reserves his greatest praise for former Posh boss Fry, 73, who is in his 20th year at the club. "He's an encyclopaedia of knowledge," Evans said of the ex-Birmingham and Barnet manager. "Barry's words, not mine, are that I'm the first manager since the early days of Darren Ferguson who has sought his opinion on things. "Jose Mourinho is the most successful manager in the modern day game, trophies-wise. I bet you he asks Sir Alex regularly about certain things - players, systems, opposition - because you're asking someone who's been on a journey. Barry Fry's been on a journey."